It’s big, it’s exciting, it’s the second annual KID Museum Invent the Future Challenge Summit, and it’s only a month away! 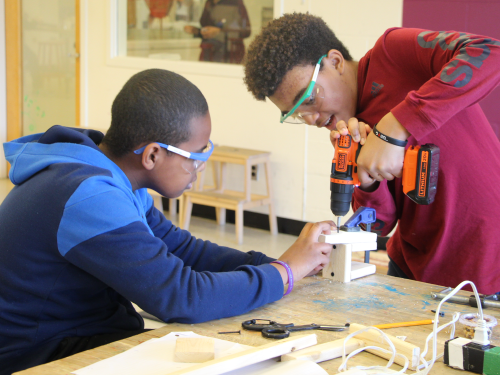 On May 11, the DC metro area’s most creative 6th-8th graders will assemble at Gaithersburg High School and compete for top prizes as their teams present prototyped solutions to the challenge question: What will you make to protect life on this planet? Some students are participating as part of a school program, while others have signed on independently, as an extracurricular project. Some teams have been working for months, and others are just getting off the ground. One thing is certain: If you’re interested, there’s still time to sign up. We’re even offering two weekend workshops to help you move your projects forward! Check out complete details about the Invent the Future Challenge Summit here (insert link). Register your team by this Friday, April 12, to guarantee a display table and a judging slot in the competition.